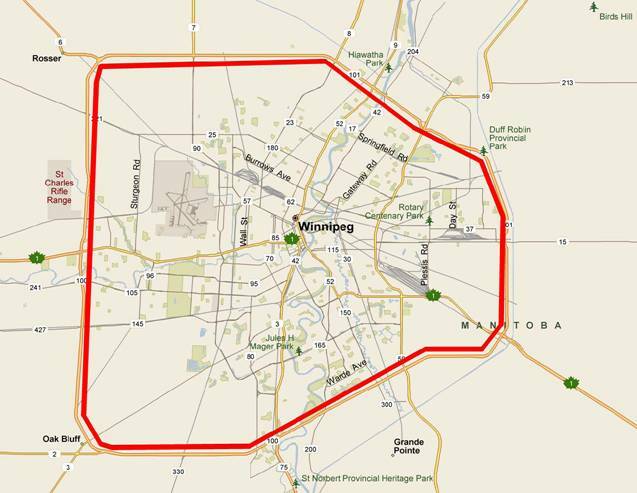 Effective May 19, 2010, Fido has released the CityFido plans for Winnipeg residents. The two CityFido plans include 2,000 or 4,000 local anytime minutes and unlimited local and international text messages. The plans are geared toward home phone replacements and the minutes are only valid within a certain geographical zone (seen below). For iPhones, any data plan starting at $25 per month (500MB) can be added to the CityFido plan. Other Fido add-ons, such as Long Distance packages and Caller Display, may also be added. Seen below is the new Winnipeg CityFido zone. Any calls made within the red border are considered local and come out of the 2,000 or 4,000 minute bucket. Any calls made outside the red border are charged at $0.35/minute. NOTE: The CityFido plans include local minutes only. Additional local in-zone minutes and airtime used for calls made and received outside your CityFido zone cost $0.35/minute. Long distance charges may apply and are determined based on your local calling area, not your CityFido zone. See fido.ca/callingareas for more information.